This split-level condo offers open living space and cozy sleeping space perfect for your getaway to Saugatuck/Douglas. 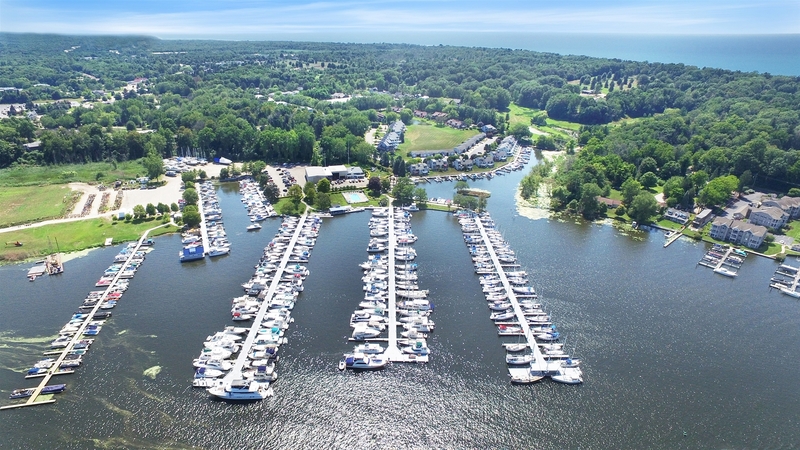 Perched on the water's edge, you will enjoy overlooking the many docks and boats. Take your coffee for an early morning stroll and watch the sunrise as you pass by the boats. Head up to the marina where you can take a dip in the association swimming pool. 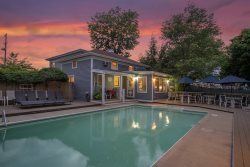 The pool is located in the heart of the marina and offers views of the open Saugatuck Harbor. There is also a playground for kids or kids-at-heat and a small convenience store. Upstairs boats a large, open living dining kitchen area with vaulted ceilings making it easy to visit with your loved ones. Fully equipped kitchen has everything you need to make a meal at home for the nights you do not feel like venturing into town. The snack bar is perfect for a quick breakfast or visiting with the chef. Large dining table is perfect for meals together for either your short vacation or your holiday dinner. The comfortable living room features sliders to the upper deck overlooking the docks and water. You'll want to head out here to enjoy the views, the fresh air, and maybe even enjoy a meal outside. The bedrooms are both downstairs. Master bedroom suite has a queen size bed and a futon for extra sleeping space. This room has sliders that open to the lower deck with water views. The attached bathroom has a walk-in shower. You will love the privacy this room provides which will allow you to relax and escape from every day life. The guest bedroom has two twin beds and the guest bathroom has a shower tub combo. If Lake Michigan is calling your name, the Douglas Beach is just over 1 mile away and our famous Oval Beach is less than 2. Downtown Douglas and Saugatuck are also a convenient distance from this condo. If you're looking for a nice, waterfront place to relax, you have found it! Welcome to Dock Holiday. This is a split level condo.